Still hung up on ruffles. 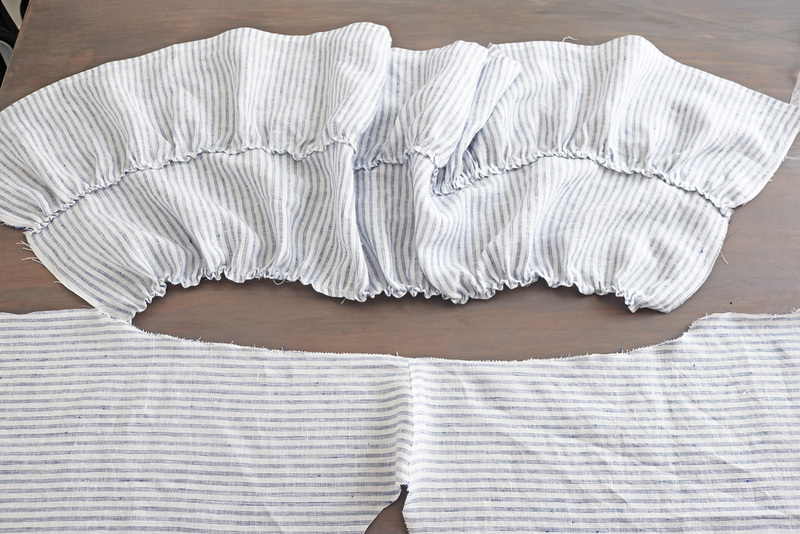 If you're into the idea but the circular ruffle seems too intimidating, gathered ones are way easier and a very satisfying detail to add, since they look like a lot of effort went in. 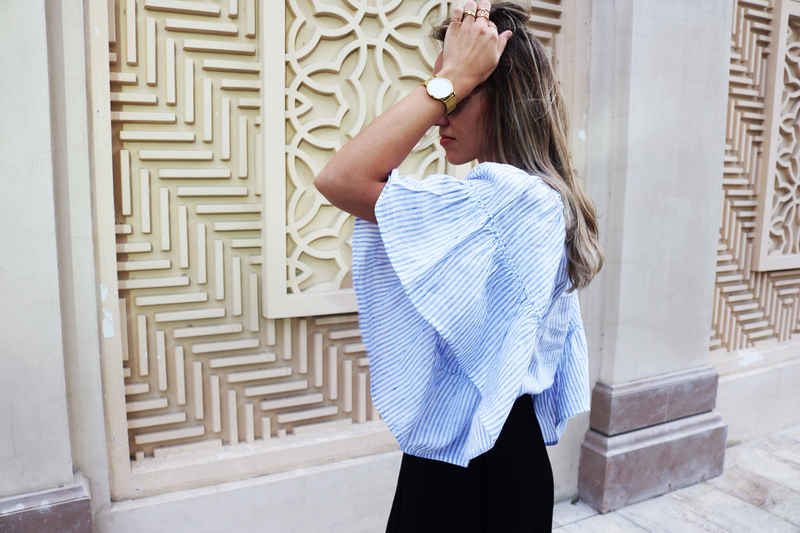 This top I believe was originally by Style Mafia, and the WhoWhatWear collection just beat me to copying it. I didn't go quite as full on the sleeves. 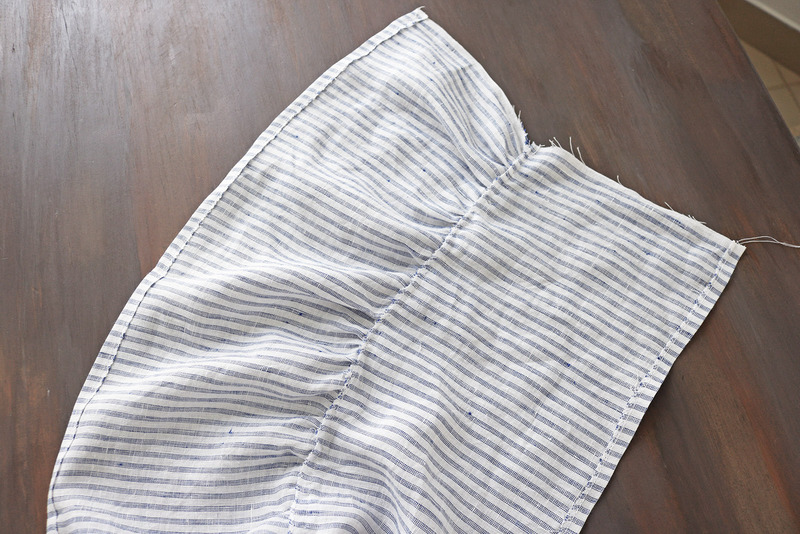 The fusible hemming tape is the way to skip one series of stitches in this project, and you know how I love a shortcut. 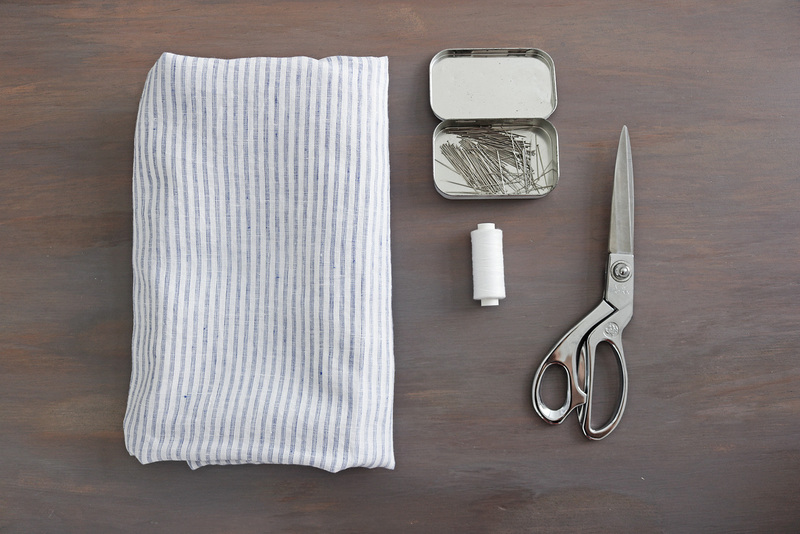 To prep the hemming tape, I like to cut it into very narrow slithers..
.. Like this. 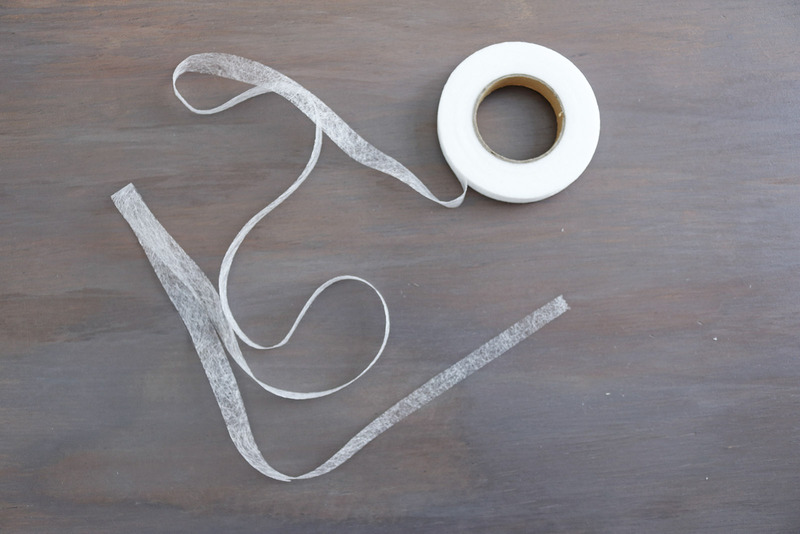 The tape I have is 1 cm wide and I cut it into 3 slithers. 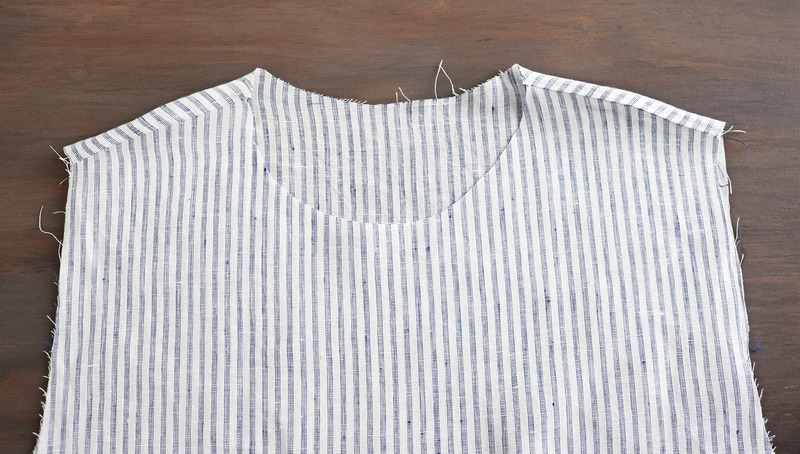 Here's how I cut my necklines. I first draft and cut out the rest of the top, so the neckline is the one thing remaining to be cut. Then I cut half of the neckline (about 12 cm down from the shoulder line at its deepest spot)..
.. And fold so the shoulder lines match, and use the first half of the curve to cut the other side. This way I get a symmetrical neckline. I actually use the same method for cutting my shoulder lines too. II. Same old flat-felled seams on the shoulders..
III. Now for the main event, the ruffles. First I cut out 4 long rectangular pieces. Two with the following measurements: 18 cm wide, 80 cm long. That's the piece that attaches to the arm holes on the top, and I determined the length as follows. 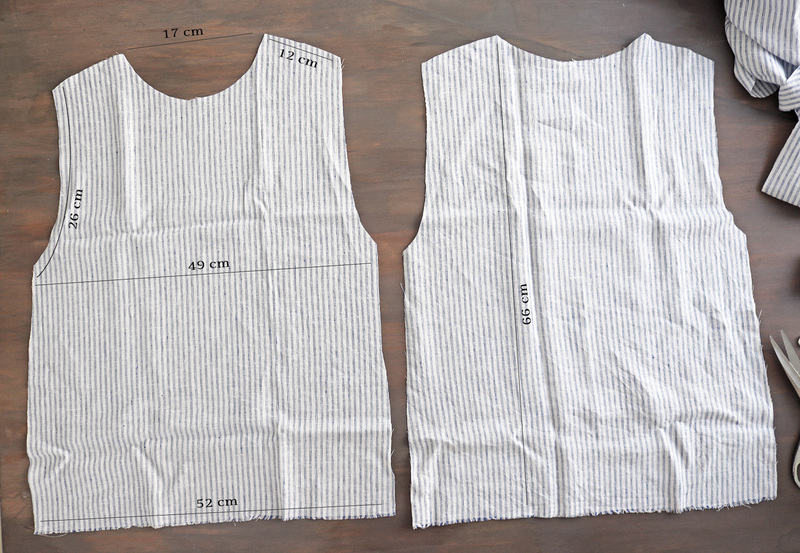 The size of the overall arm hole (front and back piece combined) is 26cm x 2 = 52 cm. I usually do a 1.5 multiplier for a semi-full ruffle, so 1.5 x 52cm = 78 cm. Round up to 80cm. And two measuring 20 cm x 140 cm. This is the lower piece of the sleeve. If I followed the same x1.5 logic, I'd take the 80 cm length of the previous piece, multiply that by 1.5 and get 128cm. 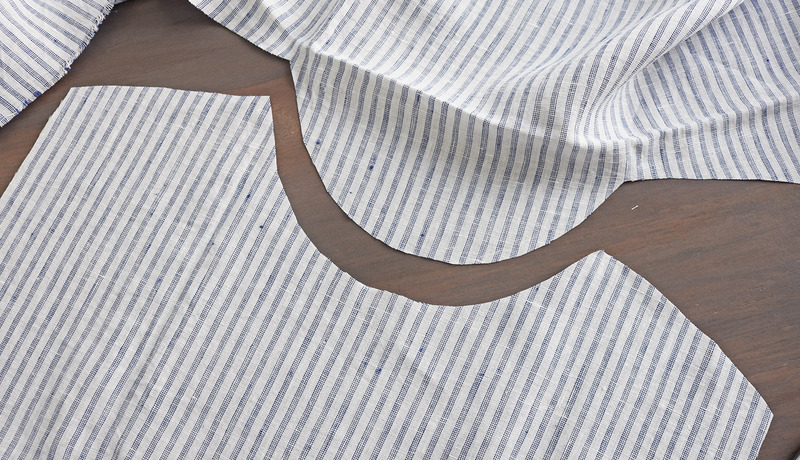 However I wanted that part of the sleeve to be just a bit fuller, so I used up the full width of my fabric, 140cm. So just over 10cm extra, which does not really even show. Ok. So each of these pieces now needs to be prepped as follows. A zig-zag on both long edges. 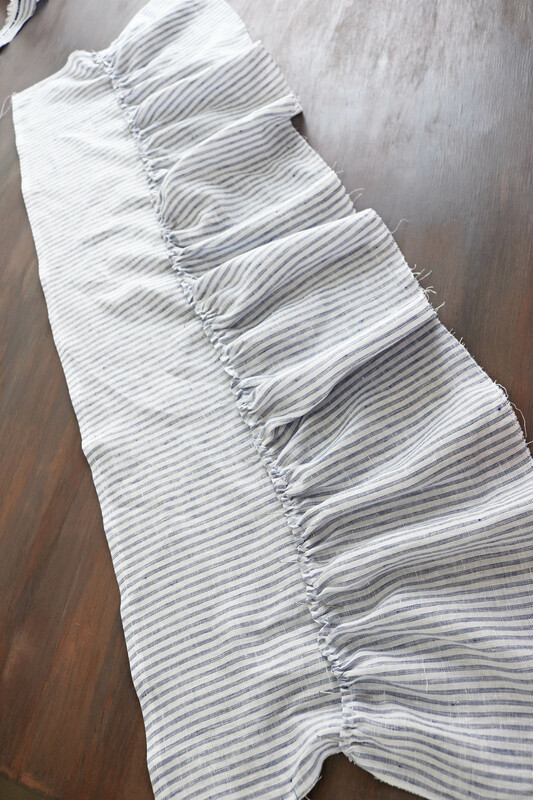 Then take the hemming tape and make an about 1 cm fold on one of the long edges, fusing it in place with the hemming tape and your iron. 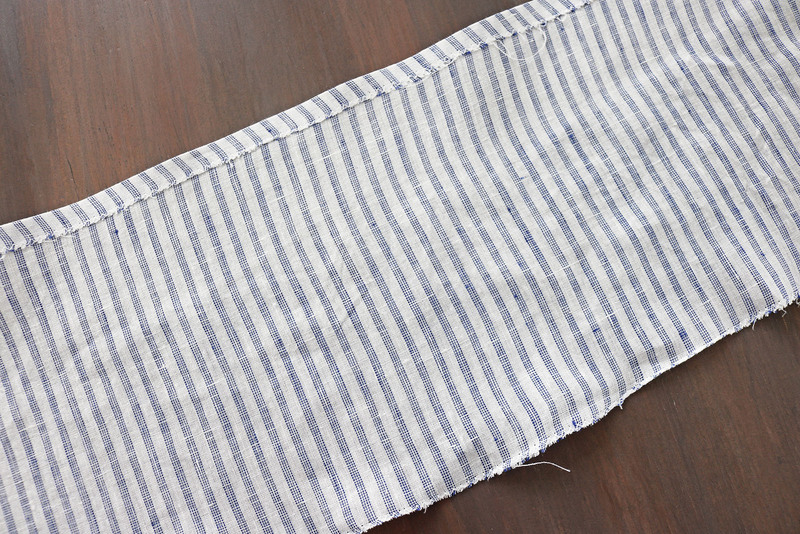 Finally, add a basting stitch to the long edge that you just prepped with the fold (the longest stitch on your machine). 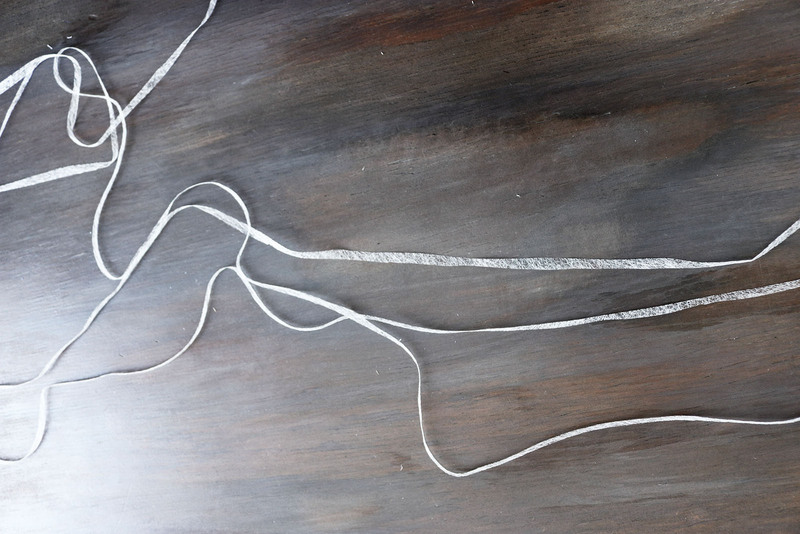 If you were a sewing purist you'd do this basting stitch using a different coloured thread, to make removal easy later. But I'm guessing you're not as I doubt you'd otherwise be visiting a blog where the author doesn't even use patterns..
Place one shorter and one longer piece next to each other, and by pulling on the bobbin thread of the basting stitch on the longer piece, gather it until it is the same length as the shorter piece. 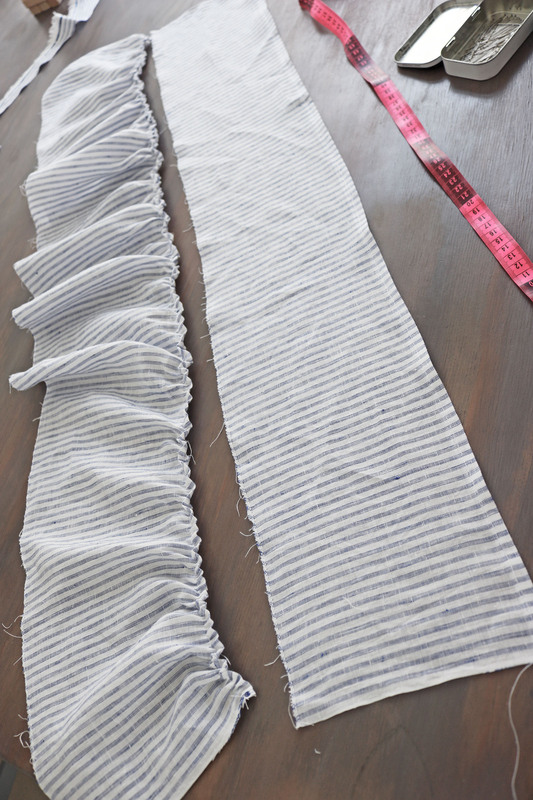 Then pin the gathered longer piece on the zig-zagged edge of the shorter piece, and sew in place, over the basting stitch. 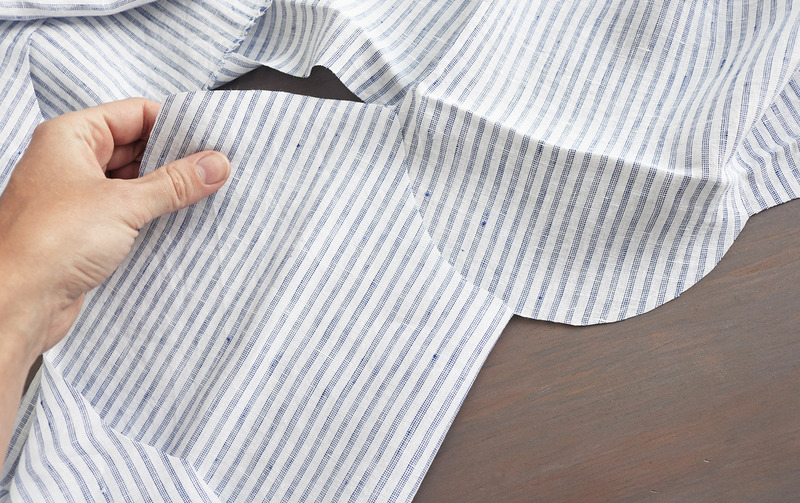 Then hem the zig-zagged free long edge of the longer piece with a single fold. That's the sleeve piece ready. .. And repeat the previous step of pinning it in place, and sewing a straight stitch over the basting stitch. 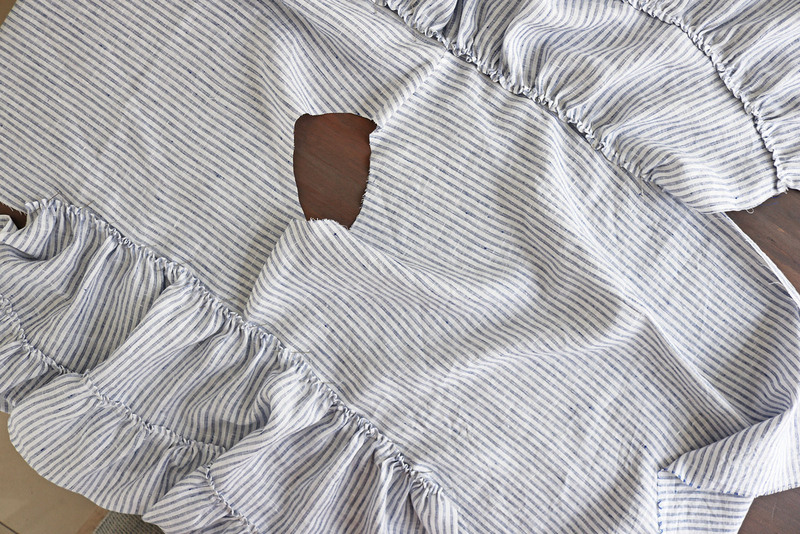 Here's where you'd remove the basting stitch if you cared about that sort of thing. Repeat the process for the other sleeve. V. After that, just a matter of aligning the sleeve under-seams and the sides, right sides facing, and sewing those together. 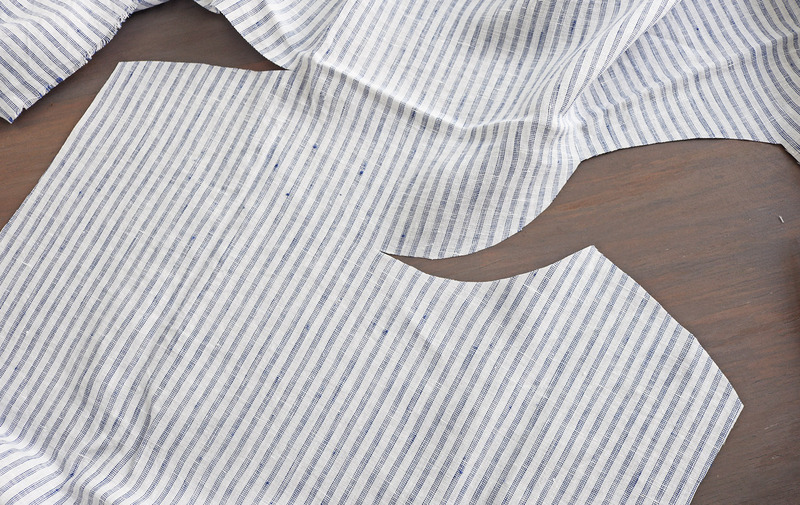 I finished the neckline with some bias tape as shown here. And finally, hemmed the top itself with a double fold, and did an extra fold at the hems of the sleeves to hide the zig-zag, since they're flying about a lot. 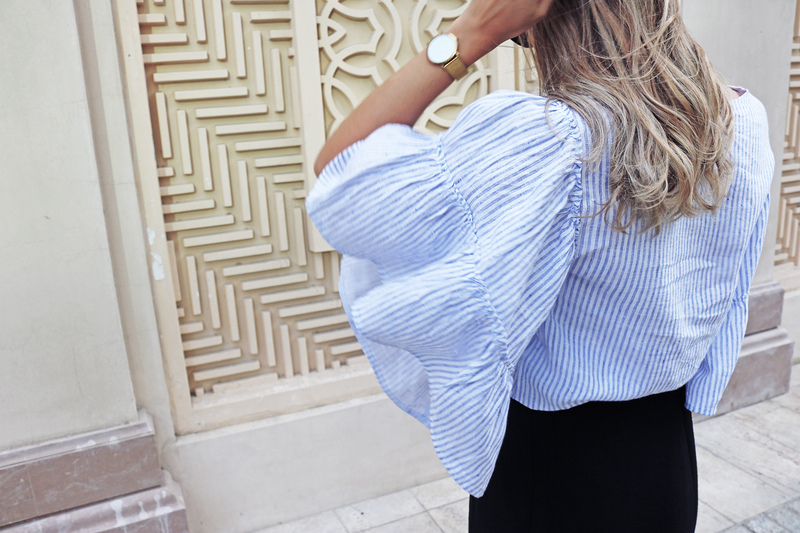 This stripy full ruffle sleev top looks so great, i am so thanksful that yu shared the proper and well labled diagram on how to come up with it. Keep up the good job. How do you make your own arm curves? I've never self drafted before and I see your measurement (you are the same size as me which is a miracle) but how do you draft the curve?